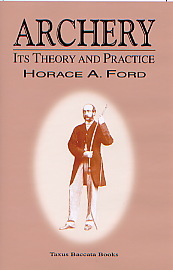 Horace A. Ford is known as the greatest target archer of all time. He first picked up the bow in 1845, and a mere four years later won the Grand National Archery Meeting held in the United Kingdom. He proceeded to win an amazing, and unmatched, eleven consecutive championships, and a twelfth “comeback” win. His high score – that of 1271 in the Double York Round in 1857 – remained archery’s high mark for over 70 years.